Jonathan Rufino Jezus Schoop (/skoʊp/ SKOHP; born October 16, 1991) is a Dutch professional baseball second baseman for the Minnesota Twins of Major League Baseball (MLB). He previously played in MLB for the Baltimore Orioles and Milwaukee Brewers. He was an All-Star in 2017. Before he became a major leaguer, he played in the 2003 and 2004 Little League World Series for Curaçao. Schoop was signed by the Baltimore Orioles as a free agent in 2008. In 2011, Schoop along with Manny Machado represented the Orioles at the 2011 All-Star Futures Game. He was awarded the Brooks Robinson Minor League Player of the Year, given to the best player in the Orioles minor league system. During his minor league career, Schoop was primarily a shortstop. Schoop played for the Netherlands national baseball team at the 2011 Baseball World Cub, 2012 European Baseball Championship, 2013 World Baseball Classic and 2017 World Baseball Classic. 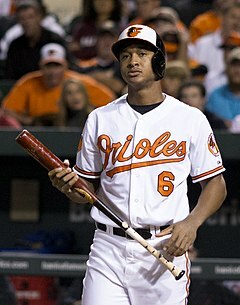 Prior to the 2012 season, Schoop was ranked by Baseball America as the Orioles third best prospect and the 82nd best overall. Schoop was recalled by the Orioles from the Triple-A Norfolk Tides on September 3, 2013. In his first major league at-bat on September 25, 2013, Schoop hit a single off Toronto Blue Jays pitcher Esmil Rogers. Two at-bats later, he hit his first career home run off Kyle Drabek, with a distance measured at 430 feet. He finished the game 2-for-3 with a home run, an RBI, a walk, and 3 runs scored. Schoop played in five games at the end of the year and hit .286 (4-for-14), scoring five runs, hitting one home run, and driving in one run. On April 9, 2014, Schoop hit the second home run of his career off of Yankees RHP Masahiro Tanaka, a towering three-run shot over the left field foul pole at Yankee Stadium helping the Orioles to a 5-4 victory. In 137 games of 2014, Schoop batted .209 with 16 home runs and 45 RBI. With the Orioles finishing 96-66, the team clinched their first regular season AL East championship since 1997. Schoop hit .300 in the Orioles ALDS sweep of the Detroit Tigers, while also driving in two runs. In the ALCS, however, Schoop only hit .091 (1-for-11), as the Orioles were swept by the Kansas City Royals. On April 11, 2015, Schoop hit his first career grand slam, off of Toronto Blue Jays reliever, Todd Redmond. During a game against the Boston Red Sox on April 17, 2015, Schoop sustained a partially torn PCL and sprained MCL, which forced the Orioles to place him on the disabled list. Schoop would end up playing in 86 games during the 2015 season, collecting 85 hits (.279), 17 doubles, 15 home runs, 39 RBIs, and two steals in as many attempts. In 387 total chances, Schoop only committed seven errors for a .982 fielding percentage. The Orioles finished the season with an 81-81 record and missed out on the postseason. Schoop hit .351 while hitting three home runs and driving in eight in the first ten games of 2016. By the end of April, he had hit four home runs, driven in 11, and hit .256. Schoop hit his first grand slam of the season on May 14 in a 9-3 comeback victory over the Tigers. It was Schoop's second home run of the game, and he drove in a total of five runs. On August 14, Schoop hit a go-ahead three run home run against San Francisco Giants closer Santiago Casilla in the top of the 9th inning to complete a seven run comeback for the Orioles, having trailed 7-1 prior to the 7th inning. Schoop hit his 20th home run of the season on August 22, his first career 20-homer season. He became the fifth Oriole on the year to have at least 20 home runs, making the Orioles the only Major League club to accomplish this feat on the year. On August 31, Schoop hit his 21st home run of the season, and the 55th of the month for the Orioles, tying an MLB record just two months after setting the home run record in June. Baltimore became the first team to hit 55+ home runs in a month on two occasions. Schoop hit his 25th home run of the season on September 30 against the Yankees, making him the fifth Oriole on the year with at least 25 homers. This tied the franchise record from 1996. They also became just the 12th team in MLB history to do so. It was also the Orioles 250th home run of the season, passing the 2000 Houston Astros for fifth most home runs in a single-season all-time. He finished the 2016 season with 38 doubles, 25 home runs, 82 RBI and batted .267/.298/.454 while starting all 162 regular season games, and the AL Wild Card game against the Toronto Blue Jays. Through July 2, 2017, Schoop compiled a .297/.352/.545 batting line with 16 homers, 23 doubles, 45 runs scored, 51 RBIs and 1.7 WAR, earning him a trip to the 2017 MLB All-Star Game. In the All-Star Game, Schoop doubled and scored the first run of the game in the fifth inning. Schoop played in 160 games for the Orioles in 2017, compiling a slash line of .293/.338/.503 with 32 homers and 105 runs batted in. He had career-highs in average, on-base, slugging, OPS, OPS+, plate appearances, at-bats, runs scored, hits, home runs and RBI. He placed 12th in the American League MVP voting. On April 14, 2018, Schoop was placed on the 10-day disabled list due to a right oblique strain. After a disappointing first half that saw him hit just .229 in the first half with ten homers and 25 RBI, Schoop got hot after the All-Star break, tying the MLB record for consecutive games with a home run by a second baseman, with five. On July 31, 2018, Schoop was traded to the Milwaukee Brewers in exchange for Jonathan Villar and minor leaguers Luis Ortiz and Jean Carmona. Schoop struggled to make an offensive impact for the Brewers, contributing a stat line of .202/.246/.331 during the remainder of the regular season. Schoop also failed to get a hit in any of his eight postseason at-bats with the Brewers. On December 6, 2018, Schoop signed a one-year, $7.5 million contract with the Minnesota Twins. Schoop competed in the Little League World Series twice on the Pabao Little League team from Willemstad. After a third-place finish in 2003, Schoop helped the team win the championship in 2004. His brother, Sharlon Schoop, is also a professional baseball player. ^ Encina, Eduardo A. "Schoop pumped to play with Curacao country mates on Netherlands WBC team," The Baltimore Sun, Thursday, February 21, 2013. ^ "O's Machado, Schoop to play in Futures Game". Retrieved June 5, 2016. ^ Sun, Baltimore. "Schoop and Bascom named organization player and pitcher of year". Retrieved June 5, 2016. ^ "Orioles announce 2011 award winners for player development and scouting". Retrieved June 5, 2016. ^ "Minor League - Baseball America". Retrieved June 5, 2016. ^ "BaseballAmerica.com: Prospects: Rankings: Organization Top 10 Prospects: 2012 Baltimore Orioles Top 10 Reports". Retrieved June 5, 2016. ^ "BaseballAmerica.com: Prospects: Rankings: Top 100 Prospects: 2012 Top 100 Prospects". Retrieved June 5, 2016. ^ "Jonathan Schoop Recalled by Orioles". Demarva Shorebirds. September 4, 2013. Retrieved September 25, 2013. ^ Ghiroli, Brittany (September 25, 2013). "Young O's show upside, pop day after elimination". Retrieved September 25, 2013. ^ Kubatko, Roch. "Schoop hits first career grand slam (O's win 7-1)". Retrieved June 5, 2016. ^ Kubatko, Roch. "Jonathan Schoop to DL, Jimmy Paredes activated". MASN. ^ "Jonathan Schoop goes on DL with oblique strain". MLB. Retrieved April 14, 2018. ^ Trezza, Joe (July 31, 2018). "Brewers deal for Schoop from O's". mlb.com. Retrieved July 31, 2018. ^ Bollinger, Rhett (December 6, 2018). "Twins sign middle infielders Schoop, Torreyes". MLB.com. Retrieved December 6, 2018. Wikimedia Commons has media related to Jonathan Schoop.